The modern warzone demands live surveillance, airborne intelligence and reconnaissance missions and warfighters are mentally prepared to be deployed at a moment’s notice. Hence, the top demand in the design of satellite communications equipment is mobility, reliability and ease of use backed by ruggedness. 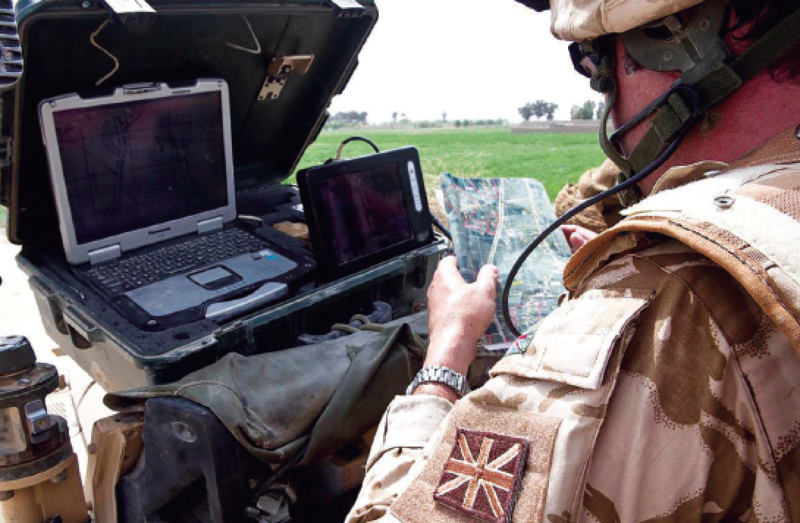 Defense organizations are faced with increasing demands to provide real time data to and from the battle field for both mission focused and Morale, Welfare and Recreation (MWR) purposes. The reason being — the informed soldier is an effective soldier and a connected soldier is a happy soldier. To meet this demand, companies are being called upon to develop more sophisticated communications tools for rapid deployment into the harshest of environments sometimes with special customizable size, weight, power or feature requirements to meet the needs of a specific application. DoD SATCOM (Department of Defense Satellite Communications) or military satellite communications (MILSATCOM) systems, tied impeccably into the terrestrial infrastructure, must deliver secure communications on demand, on the move, and across the globe. The design of such responsive future architecture, with the precise balance of both military and commercial satellite capabilities, must be based on real-time situational analysis of necessities. Warfighter requirements are paramount to the design of forthcoming satcom capabilities. Quick-assembly communications equipment, such as fly-away satellite terminals, are becoming increasingly important to specialized ‘Rapid Deployment Forces’. Such services typically consist of elite military units of warfighters as well as special forces, search and rescue teams, marines, paratroopers, etc., that need to respond to emergencies, establish communication networks and carry out tasks successfully in a matter of hours. Most of the time, the rescue window or response time is just 30 minutes. Niche groups like a U.S. Air Force Rescue Squadron’s Ready Reaction Force (RRF) are capable of rapid response to situations that develop in a very short time frame. For such situations, Norsat has developed military fly-away satellite terminals such as the GLOBETrekker 2.0 with a one-touch interface that enables easy operation and rapid deployment, with set accomplished in only ten steps and the unit can auto-acquire a satellite in less than five minutes. Specialized components like the universal LNB allow automated frequency selection for worldwide deployments. Moreover, its modular architecture enables easy sub-assembly replacement and RF band switching in the field. Currently deployed by militaries around the world, the GLOBETrekker 2.0 includes IP65 compliant sealed equipment for all weather use and digital leveling technology for deployment in uneven terrain. Norsat’s GLOBETrekkers are being used for warfighter comms by 38th Rescue Squadron (38RQS) and 31st Rescue Squadron (31RQS) — Defense Media Activity (DMA)) fielded GLOBETrekkers are also being used for the transmission of video from the field in support of the U.S. Department of Defense (DoD). 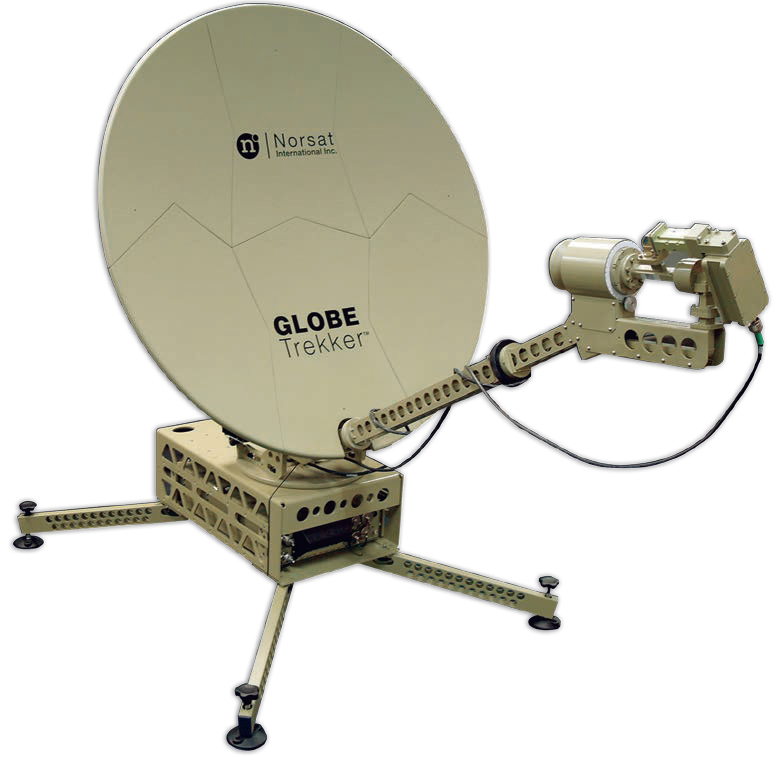 The GLOBETrekker is also being used by the National Geospatial-Intelligence Agency (NDA) for transmission of imagery to support warfighters in the field. For the warfighter, communication does not simply encompass two-way radios to give or receive orders and updates. Modern militaries require secure on-demand communication ranging from email to HD video feeds and Voice-over-Internet-Protocol (VoIP) to simpler services like instant messaging. 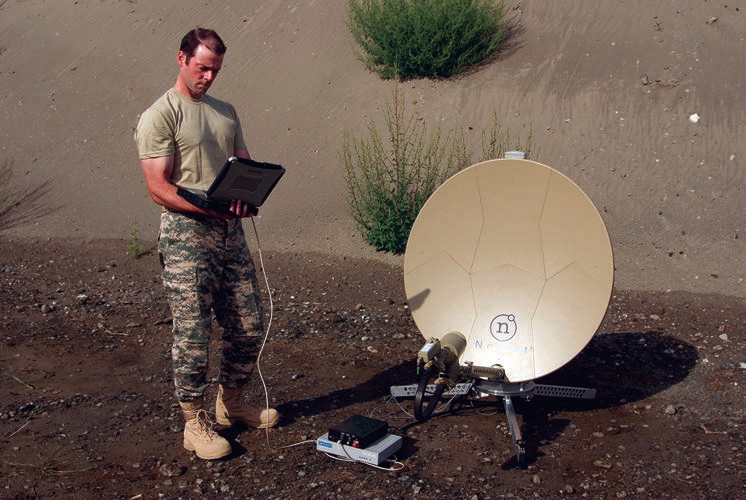 Portable satellite systems are central to enabling military personnel to stay connected by internet and email service and, where appropriate, through videoconferencing. A portable system is able to establish a link as needed and can be redeployed at the end of any mission. Keeping this requirement in mind, Norsat developed SATCOM-baseband kits — integrated fly-away units packaged in two small airline carry-on cases that provide secure and non-secure communications via an Ethernet connection. For example, the CFK-100E model supports simultaneous voice, video and data communications over classified and unclassified networks anywhere in the world via two removable Cisco ASA5505 security appliances for red/black separation and an Explorer 710 BGAN satellite terminal. The kit is packed in two airline carry on backpack cases and includes a HD 720p webcam and headset for remote video conferencing, enabling live updates from the field. For extremely remote warzones where electricity is not readily available, the CFK-100E integrated power supply and SMART UPS can be powered via AC, DC or standard BB-2590 or UBI-2590 batteries. Surveillance and monitoring of RED zones critical warzones enables soldiers to stay two steps ahead of the enemy by anticipating the next move. This sector is going through unprecedented changes as militaries have moved toward a holistic network-centric approach to their communications. From war zone operations to disaster recovery and homeland security operations, surveillance in modern times involves SATCOM systems syncing data effortlessly to report developments on land, air and sea. Realizing this, Norsat has developed products and components for UAV’s, monitoring of coastal regions, borders and high-value targets and assets. While considering warzones, one tends to visualize an actual battlefield on land or an aerial attack. However, approaching the warzone via sea is an important part of strategic planning for naval warfighter communication. Tracking a narrow satellite beam in geosynchronous orbit 35,000 km. away from the oceans’ surface, while the ship below rolls and moves through storms toward warzones, is no easy feat. Hence, modern militaries are investing in MILSATCOM products manufactured by specialists in the maritime industry. Moreover, the data transferred by the navy between vessels, maybe highly classified — so maintaining resilient and secure communications is a necessity. Following such rigorous and standardized certifications enables organizations to provide military customers with demonstrated, high-capacity communications systems that are designed to perform under even the most extreme maritime environments, in or out of the warzone. Additionally, the MarineLink Naval series are certified for use on the Military Wideband Global Satcom (WGS), CE0678, Intelsat and Anatel networks. In particular, the ARSTRAT WGS certification project for Norsat’s COM15X required rigorous program management and planning as well as technical expertise from RF engineers to complete the required testing, over multiple years. Advanced RF expertise was required to understand all of the WGS requirements based on MIL-STD-188-164B, apply those requirements to the design of the product, and then execute the necessary tests to verify that the design is compliant. 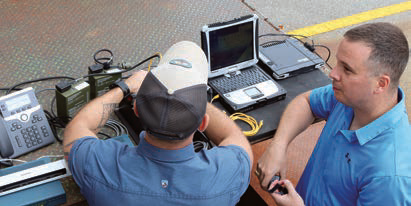 Members of the USAF setting up a Norsat CFK kit. 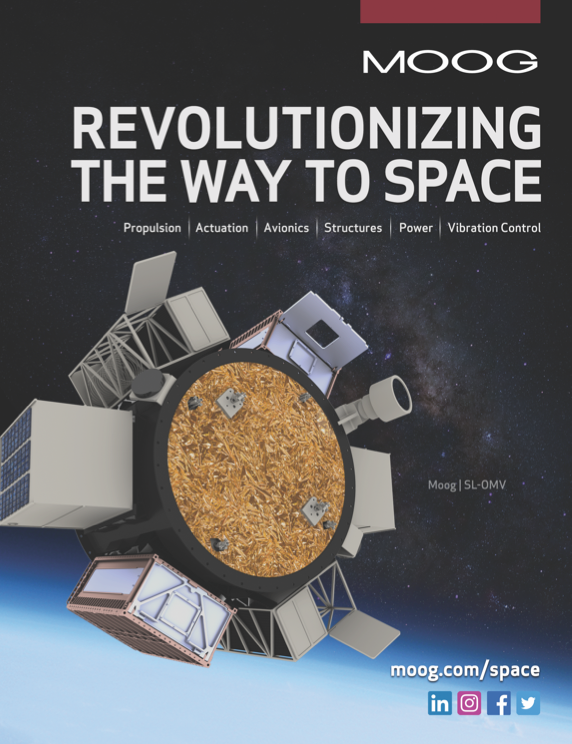 Deployability, mobility, Beyond-Line-Of-Sight (BLOS) capability, and data security requirements drive military satellite communications development in modern times. Enhancing these capabilities will deliver consistent and reliable communications throughout a mission, whether stationary or mobile. 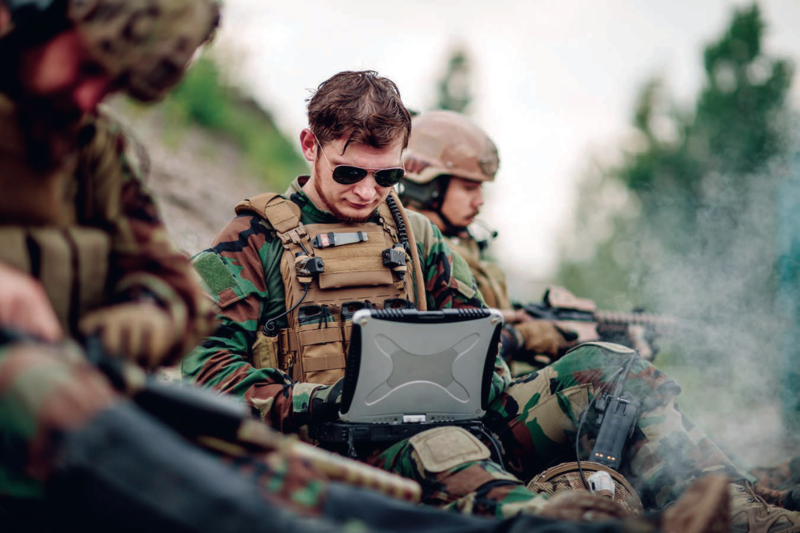 Complete consideration of the drivers, trends and technology that fuel the military communications sector, will help development of superior SATCOM equipment. Norsat is also harnessing the power of AI (Artificial intelligence) for quick auto-satellite acquisition and instant communication, which is predicted to be absolutely essential to win on the modern-day battlefield. 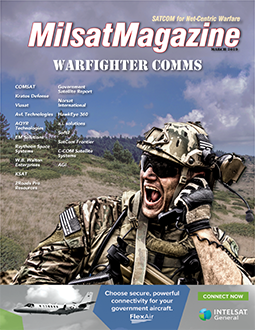 Immediate action must be taken to ensure that near-term MILSATCOM needs and evolving requirements are identified, documented and reproduced in a responsive, integrated, and reasonable architecture to support the modern warfighter well beyond the turn of the century.